Home » Personal Finance » How to Verify Aadhaar & PAN at EPF UAN Website? Once you link your Aadhaar and PAN with EPF account, you need to digitally verify Aadhaar & PAN at EPF UAN website. As per EPF UAN website, digitally verification of KYC such as Aadhaar & PAN is mandatory for availing EPF services. In this post, we will take a look at the complete process of How to Verify Aadhaar & PAN at EPF UAN Website? We will also take a look at online verification status of KYC. The steps for online verification of Aadhaar and PAN at EPF UAN website is given below. You will be prompted for UAN Login and Password. After Entering UAN and Password enter Captcha text and press Sign In button. After successful authentication, you will be taken to the page where it will show your member profile, UAN Card, and Account setting section. Under Member Profile, you will be able to see the section of AADHAAR and PAN. 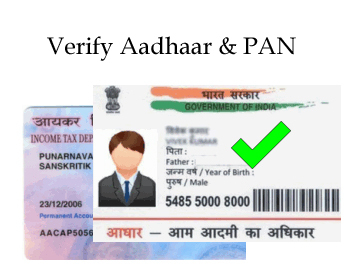 If AADHAAR and PAN are not verified it will show Unverified text with red color beside Aadhaar and PAN number. Along with that, it will also display “Verify” button. For Aadhaar verification press Verify button beside Unverified text in Aadhaar Section. Now the system will verify your Aadhaar number with UIDAI database. You will see message box with Verifying text. On successful UIDAI authentication status is updated to Verified with UIDAI. In case of mismatch in Name, DOB or Gender it will display a warning message. For PAN Verification press Verify button beside Unverified text in PAN Section. Now the system will verify your PAN number with Income tax database. On successful verification it will say PAN Verification Successful and status will be changed to Verified. KYC means Know Your Customer. It is a process to know detail about Customer. To check Online Verification Status of KYC, login to UAN Portal and go to Manage > KYC. In this section, you will find KYC related information. You can also see a section for KYC Pending for Approval and Digitally Approved KYC Section. The last column under Digitally Approved KYC section is Online Verification Status. The status under both PAN and Aadhaar should appear as Verified. Under Digitally Approved KYC Section you should have minimum following documents approved for KYC. PAN- Mandatory if you do withdrawal before 5 years of EPF contribution as TDS is deducted. 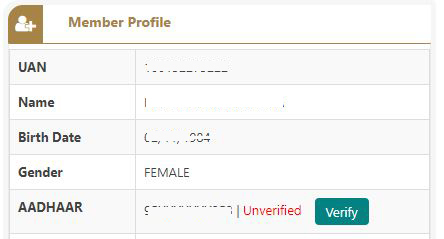 If you find missing information in this section you can add it using Add KYC section. Once you are done with adding detail press Save Button. Now this detail will appear in Pending KYC Section. You have to wait for the employer to approve the KYC details. After approval by your employer, these documents appear in Digitally Approved KYC as shown in the image below. I hope the information given here for the online Verification of Aadhaar & PAN will help you in the completion of online verification. In case you have any query feel free to post it in the comment section. Dear brother my aadhaar already verified with name as PERUPOGU SAGAR.but pan is issuedas SAGAR PERUPOGU.so I had changed my name in UIDAI data base as SAGAR PERUPOGU. Now pan and aadhaar are issued as same name I.e.,SAGAR PERUPOGU. But in UAN portal my name is registered as PERUPOGU SAGAR. 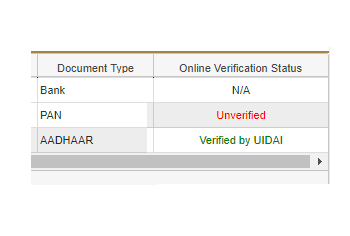 Now the problem is while I am trying to change my name in UAN database under modify basic details section it is showing aadhhar is already verified in unified portal ur details are not editable. So pls help me in this problem how to change my name in UAN and to verify both aadhaar and pan. You have got unique problem. As per my suggestion you need to change your name in UAN database via your employer.You can not do editing as it is already linked. I was successfully able to link my Link my Uan with Aadhaar through the ekyc portal. But the problem is when i login to my UAN profile my Aadhaar number if not reflected there. Can some one help me out and let me know in how can i update my Aadhaar number to my profile? If your Aadhaar is linked it should get reflected in your UAN profile. If it is not appearing I suggest you to provide number again in UAN portal and update. I too have a problem of aadhar name mismatch in UAN PROFILE I WAS able modify and my employer accepted it but it is waiting for pf thane office to approve it’s already been 6 business days do I have to do something else?? It will take few days to get approval from PF office. Please wait for one or two more week. You need to find out reason for non verification and correct as per requirement. I tried to verify my PAN in EPF account, but after login in EPF Home page there is no Verify Button next to PAN, After PAN number there is text ‘Failed’ in Red color. This happens when Name or other detail mismatch is found in Aadhaar and PAN.Kindly correct and update name and other details.Record should match at both the places. AADHAAR authentication failed. AADHAR number, Name, DOB or Gender mismatch with registered data. Pls correct your Name and other details on Aadhaar or at EPF and try to verify again. Thanks for your quick response , will try and get back to you if hooked up with queries. Your service and guidance is much appreciated.